Lest anyone think that Kia was going to change its approach to the market because of Hyundai’s decision to launch a separate luxury brand, this Korean automaker is showing us that it simply ain’t so. Indeed, just as the global auto show season heats up, Kia announced this week that a new Cadenza sedan will launch next year. The Cadenza is based on the same platform underpinning the Hyundai Azera, the largest of Hyundai’s models that won’t transition to the upcoming Genesis luxury brand. Genesis Motors will be composed of models similar to two current Hyundai vehicles — the Genesis sedan and the Equus sedan, with the new models named the G80 and G90, respectively. The Genesis marque will launch in 2018. Kia’s relationship with Hyundai is a complicated one, at least to the non-Korean observer. In 1998, Hyundai purchased a 51 percent stake in its smaller and failing competitor, but has since reduced its holding to 33.88 percent. The two manufacturers share platforms and key components, but management, styling, model choices, and most manufacturing are separate. That’s one reason why Kia has the Soul and Hyundai doesn’t have an equivalent. At the same time the Genesis Coupe is exclusive to Hyundai. The Kia Cadenza has been on the market since 2010, although the first models didn’t reach North America until 2014. The second-generation model will arrive for the 2017 model year, enabling this sedan to keep up with such competitors as the Lexus ES 350, Buick LaCrosse, Acura RLX, and the Lincoln MKS. Inside, Kia promises a cabin with a “premium new design” and more “higher-quality materials than ever before.” In the 2017 Cadenza, Kia is benchmarking European tastes in a bid to raise the bar. While the Cadenza will appeal to one segment of buyer, Kia seems likely to introduce a few more models going forward, including a few exclusive to the brand. The luscious GT4 Stinger coupe concept, introduced at the North American International Auto Show in Detroit in 2014, is one possibility. 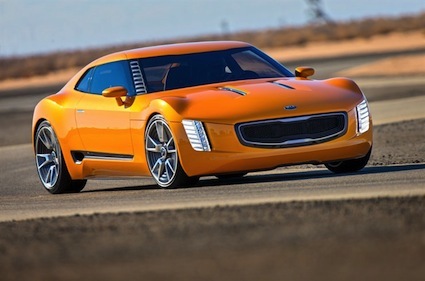 If Kia is looking for a signature model, then the Stinger would be it — the rear-wheel drive concept is powered by a twin-turbo engine making 315 horsepower and paired with a 6-speed manual gearbox. It is a head turner and would also be Kia’s first neck snapper. Kia might also bring to the market one or two other models that have recently gotten a lot of attention. Both were shown at SEMA 2015 in Las Vegas earlier this month. Kia Forte Koup Mud Bogger. The Kia Forte Koup Mud Bogger 10 opens up true off-road possibilities for a brand that doesn’t have a player in the segment. At least not yet. This vehicle has been lifted by four inches and outfitted with 28-inch tires. The exhaust pipe comes out of the rear bumper, replacing the current low-hanging pipe. Sparco seats and safety harnesses are other important features. On the downside, the concept is still front-wheel drive — to succeed, a true 44 variant or at least all-wheel drive ala Subaru is a must. Another SEMA 2015 hit was the A1A Optima concept. 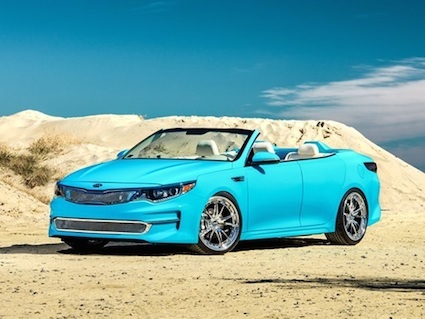 Based on Kia’s popular midsize sedan, this 2+2 four-door convertible — with suicide doors — and outfitted with stunning 20-inch wheels and a unique front fascia, shows us a dazzling model that could change everything for Kia. Powered by a turbocharged, 245-horsepower engine and blessed with a throaty exhaust pipe, the upscale visage is further enhanced by an all-leather interior. Notably, an adjustable suspension lowers this convertible to enhance its drivability. Although only the next-generation Cadenza is officially a “go,” we’re likely to see further separation between the two Korean makes going forward. Turning one or more concepts into a production reality would further the cause and give Kia fans more reasons to hold fast to this rapidly evolving brand. Sketches and photos copyright Kia Motors.